27 | November | 2014 | Coyote Moon, Inc.
ac startup problems can take many forms, but stalling at the gray screen can be one of the most troublesome, because there are so many possible causes. In addition, there are many Mac issues that get mistaken for the gray screen startup problem. What Is the Gray Screen Startup Problem? 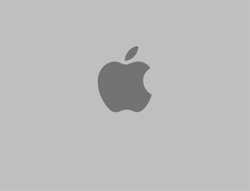 The gray screen problem can occur right after you start or restart your Mac. The problem is characterized by the display changing from the blue screen that occurs at power up to a gray screen. You may see only the gray screen itself. It may also include the Apple logo, a spinning gear, a spinning globe, or a prohibitory sign (a circle with a slash drawn through it). In all cases, your Mac seems to be stuck at this point. There are no unusual noises, such as disk access, optical drive spin up or down, or excessive fan noise; just a Mac that seems stuck and won’t continue to the login screen or the desktop. There is another common startup problem that is often mistaken for the gray screen issue: a gray screen with a folder icon and a flashing question mark. That is a separate problem, which you can usually easily fix by following this guide: How to respond to a flashing question mark on a Mac.